Editor’s note: This is the first article in a new column about design leadership. We’ve asked a handful of design leaders to respond to prompts each week. This week’s prompt was “What is the biggest problem in the design industry?” We’ve split their fantastic responses into 2 articles this week, and you can read part 2 here. Below, read responses from Nick Schaden, Libby Bawcombe, and Joe Robinson. Design-driven thinking is now everywhere, from tiny startups to Fortune 500 brands. Integrating design into a company’s values is increasingly critical for success. Even with these wins, design’s biggest threat is its lack of diversity. The tech industry’s lack of employee diversity has been well documented. We hear about commitments to improve diversity among designers, developers, and other tech staff. Still, over the past 2 years, the numbers have barely moved. Design leadership, press subjects, and conference speakers remain disproportionately white and male. For those of us lucky enough to already to be in this field, we have to be more proactive. It has to start on an individual level. Blaming the “pipeline” over not enough applicants from women and people of color doesn’t cut it. We need to educate ourselves about the realities of “cultural fit” and confirmation bias, as they can end up weeding out otherwise great candidates who don’t happen to come from the same backgrounds, schools, and communities as us. We should also move beyond friends and former coworkers for leadership, recruiting, and speaking efforts. Good design should start and end with our users. Realistically, though, most work requires approvals from fellow designers before users even hear about it, especially during tight deadlines or heated design critiques. So, a more diverse design community adds more than moral or cultural benefits—it also makes us fundamentally better designers. If designers came from a wider range of racial, cultural, and socioeconomic backgrounds, we’d immediately see less broad, often-mistaken assumptions about our users. When you bring in more designers from a wider socioeconomic spectrum who didn’t grow up immersed in tech companies, the profile of an “average user” changes. They’re not on a 27-inch cinema display for web browsing. They don’t update their smartphone every year. And when you have more cultures and backgrounds contributing to a design sprint, better functionality for international and underrepresented markets comes along for the ride. Your user base expands. We’d also get slightly less fetishization of what’s cool and shiny and more on what’s usable and has greater impact. More perspectives on race, color, economics, and religion expands design priorities. We can afford a bit less money and attention on apps targeted at 25-year-olds living in the Mission, and focus more towards critical issues like healthcare, economic inequality, education, and the environment. It goes beyond widening the base and the quality of our work. It’s for the longevity of our field. The more we represent our community, the less chance our work could be ultimately rejected and marginalized. Design is having a huge impact on the world, and we can do better on the diversity front. We’re in an industry that’s about empathizing with our users, but that only works as far as our community can extend. In light of this, we have a responsibility to do better. One of my biggest concerns for the design industry today is the way we hire designers for our teams, particularly the problematic trend where hiring managers prioritize technical skills over thoughtful workflow processes and fit. You’ve probably seen the types of job postings I’m referencing: verbose descriptions studded with industry buzzwords, long lists of requirements that would stretch any designer far beyond their comfort zone. Hiring managers are asking an awful lot of a single designer. 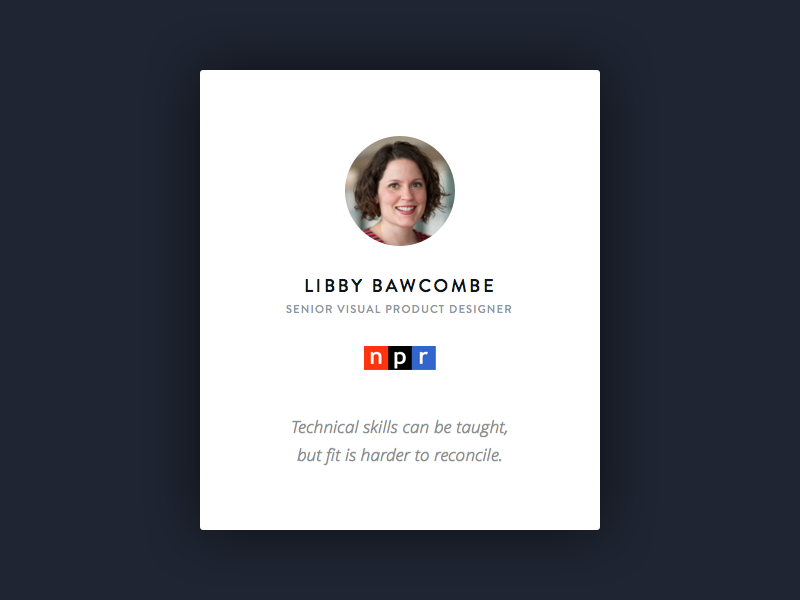 They want an expert in IA and UX, a whiz at responsive layouts and visual design who can whip up infographics and interactives, someone that knows products and ads, but also can prototype and code, and can manage up and down, who writes publicly and gives talks, and also knows all the software. I suspect it all began when the economy was pulled into a recession and hiring slowed. Businesses were forced to make choices about limiting the number of hires, and they tried to find the fewest number of people to do the most number of things. Yet, the more important issue to tackle is that job descriptions like these determine a designer’s qualifications by ticking boxes on skill set, rather than teasing out a designer’s process. When we consider candidates merely by skills, we may be ruling out great design-thinkers who may be lighter on technical skills but gifted with brainstorming and collaboration. Over time, technical skills can be taught, but fit is harder to reconcile. Articulating process and fit can be difficult. While we tend to assume that fit can only be gauged in person, there are ways we can prompt potential candidates to reflect on their own processes, prior to an interview. Photo by #WOCinTech Chat. Creative Commons Attribution 2.0 Generic. How do you brainstorm? What are there methods or tools that help you generate ideas? How do you document these ideas? How do you collaborate at the beginning of a project? Who do you talk to? How do you gather more information? What shape do your ideas initially take? Words, sketches, wireframes, code? What is your favorite way of communicating with teammates? How do you adjust your communication style to work with others? What is your working style? Do you thrive on lots of feedback? Would you rather work out solutions on your own? How do you share work in progress? Can you discuss how you worked through an unexpected turn in a project, or how the assumptions and results didn’t match up? If a candidate can’t communicate their process or hasn’t given it much thought, how can either of you determine how they’ll complement your team? 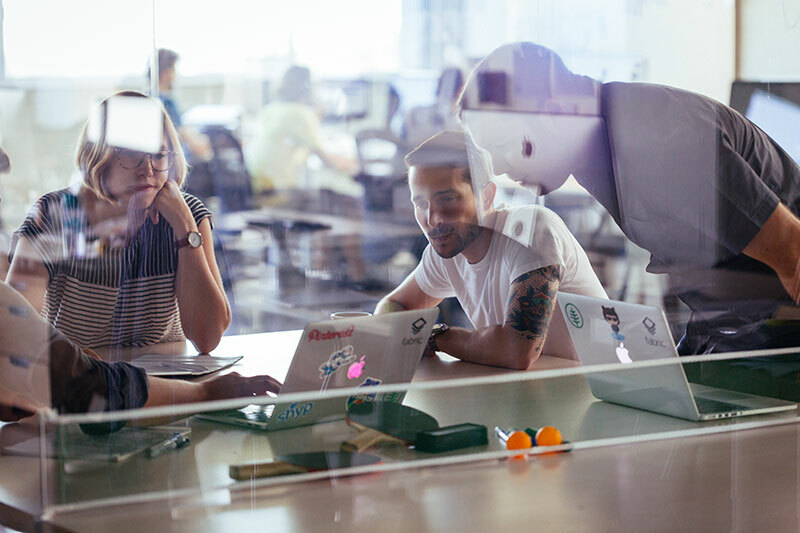 Prioritizing discussions of fit in the conversation sets the tone that process is significant for successful creative teams to work together. The problem of finding and prioritizing meaningful work isn’t unique to creative professionals, but the practice of design is one that lends itself to fixing big problems. In a recent survey, 30% of millennial workers identified meaningful work as the most important factor of career success. We all want to do our best work and leave our mark on the world, so why aren’t we out there chipping away at the big problems? To start, finding and focusing on meaningful work isn’t easy. Sometimes we get caught up in day-to-day task lists, or putting out fires that seem to magically ignite in Slack channels. Even if we have the luxury of distraction-free time, meaningful problems can be intimidating. It’s tough to go all “Elon Musk” and tackle rocket science while balancing work and family life. Don’t lose hope, though. If you’re struggling with the problem of finding meaningful work, here are 5 ways to get started down the right path. Block time to explore industries, trends, and problems that interest you. And don’t try to do this all at once—set aside time on a recurring basis and give yourself the space to explore topics that are meaningful to you. If you spend most of your time in one of the infamous design bubbles (hello, San Francisco! ), make it a personal goal to stretch your perspective. Observe the product and design needs of family members who don’t live near you, look at the projects of big philanthropy organizations like the Gates Foundation, watch TED talks for inspiration, travel. There are lots of meaningful problems that design hasn’t fully addressed yet. Healthcare, social services, government, education—all pillars of modern society that are in need of design love. 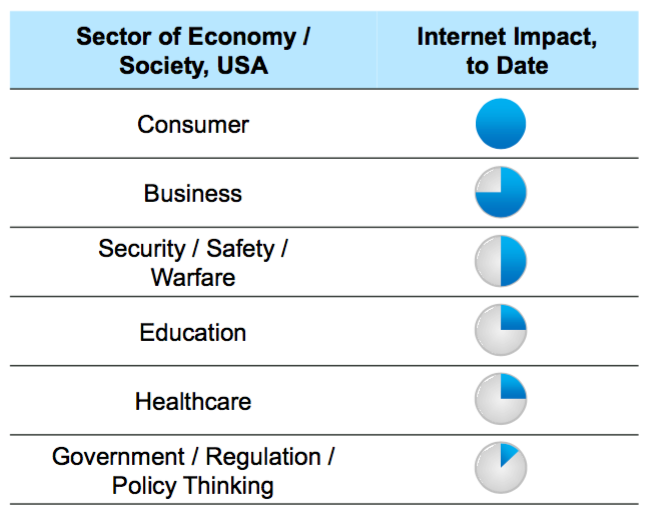 Andrew Yang’s recent post “What’s eating Silicon Valley” does an excellent job of looking at the needs in some of these areas. This chart shows parts of the economy that are still ripe for disruption. As the evolution of these sectors takes place, many interesting design problems will need to be solved. Source: KPCB Internet Trends 2015. Observing the paths others have taken is a fantastic way to start your own journey towards meaningful work. Look for designers who are working on the problems you care about. How did they arrive in that situation? What steps did they take to build the experience and skills needed to work on the problem? Most of us aren’t awesome at breaking down large goals into multi-year processes, so skip the 5-year plan. Think about steps you can take in the next 10-20 minutes to move closer to your objective. Gather design examples, find blogs that cover your topic of interest, invite a friend to coffee if they might know something about the space. The important part is to avoid getting derailed with unreal expectations for your progress. Here’s the thing to remember: you know you want to do meaningful work, but it often takes time to figure out what that means for you. Give yourself the time and permission to explore your interests. There are a lot of meaningful design problems in the world that need your talent—allow yourself the room to find them. Write your own response to the prompt “What’s the biggest issue in the design industry” on Medium and submit it to our publication. 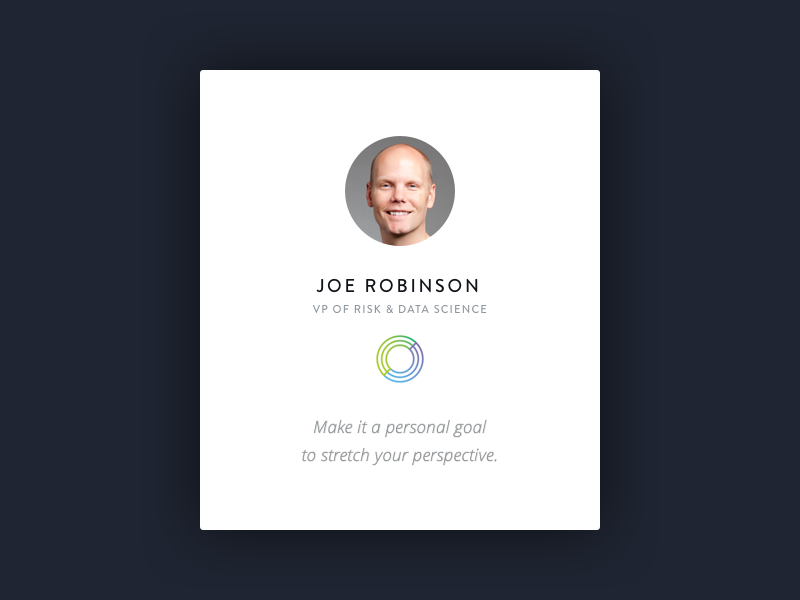 Joe Robinson works at Circle, a startup in the personal finance space. 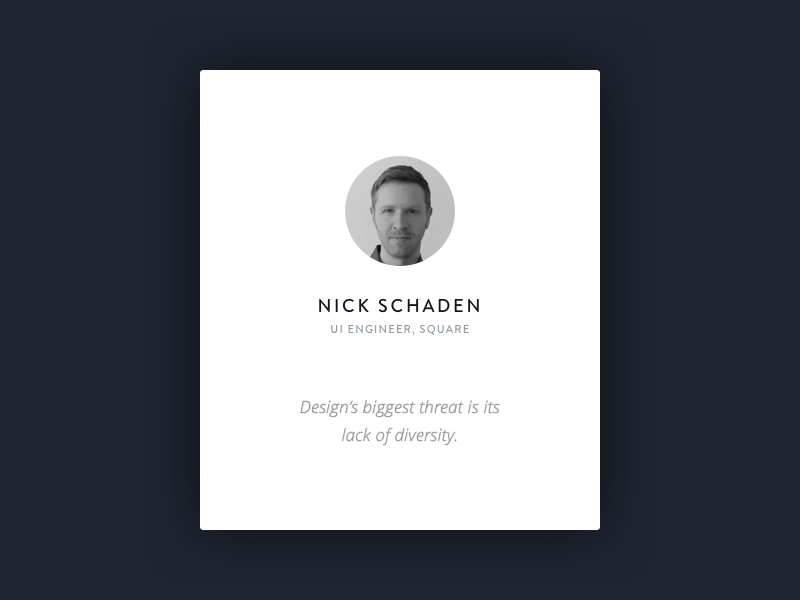 He organizes Designers + Geeks and Manifesto, a product design conference. Joe previously worked at Square, where he was product lead for Square Dashboard and Square Market. You can find him on Twitter as @i8joe.